in the wee small hours of the morning, or the dark hours of late late night time…however you prefer to see it. all included some kind of chocolate. Alright, they have included A LOT of chocolate. White, dark, and milk have all been represented. Should I apologize for this kind of behavior? Maybe only to my hips…. Isn’t it Halloween soon or something? Don’t we all have chocolate on the mind! typing and writing about chocolate. This wonderful White Chocolate Popcorn is very easy to make. It doesn’t need to bake. See you back here tomorrow for something without sugar and chocolate. You can eat it while you make this popcorn! 1. Pop you popcorn according to package directions. 2. Put your white chocolate in a microwave safe bowl. Heat it for 30 seconds and then stir. Repeat until it is all melted. Don’t get it too hot! If you don’t heat it slowly….it can burn. Oh, that would be one sad day. Burned white chocolate. What a shame. 3. Add the shortening to your melted chocolate. Stir until melted. 4. Place your pop corn in two large bowls. It’s easier to get all of the goodies incorporated if you use two bowls instead of one. 5. 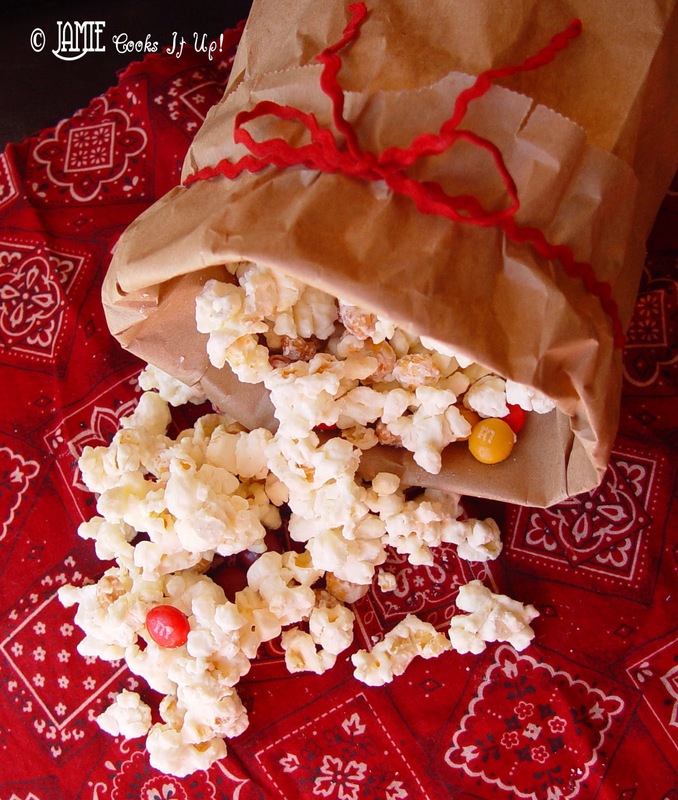 Pour the white chocolate over the popcorn. Stir it all around to incorporate. 6. Add the m and m’s and the peanuts and stir so they get all stuck in the white chocolate as well. 7. 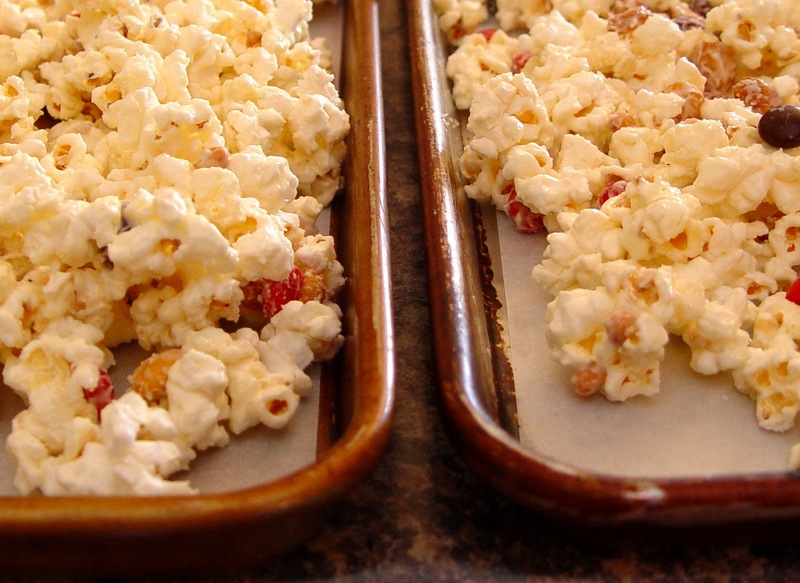 Lay the chocolate covered popcorn on two large cookie sheets that are lined with wax paper. 8. After the chocolate has set (about 30 minutes) break it into chucks and eat it up! Or, bag some up and give it to a friend! That sounds (and looks!) delicious! Looks yummy Jamie! I will have to be making some of this soon! Thanks for sharing! Okay, have I told you how much I love you, lately? I have been looking for this recipe for weeks! 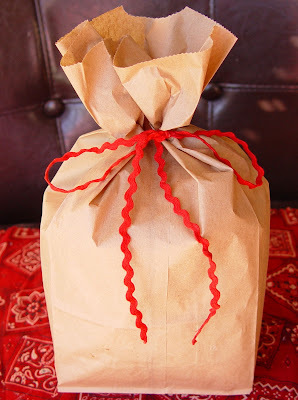 I want to make bags of yummy popcorn with two movie tickets(to our local dollar theater) tied to the bag with Christmas ribbon for my kids to give their friends for Christmas! You are a life saver! Thank you! Keep the chocolate recipes coming!!!! 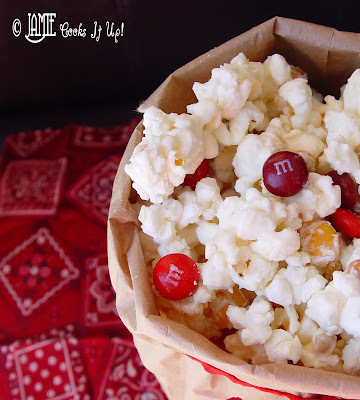 LOVE this recipe with popcorn drizzled with white chocolate….wowsers that is a yummy concept! I love seeing recipes Jamie! Thank you for taking the time to share them with us! OOPS!>>>That was, “I love seeing YOUR recipes Jamie! My daughter can't wait to get her braces off so we can make and eat some of this white chocolate popcorn together. And this is a great gift idea! Just made a batch…delish! I agree it would make a great gift, too. Would it need airtight packaging? Also, has anybody kept this popcorn around long enough to know how long it keeps once it's made? You would need to pack it in an air tight container. As for how well it keeps, I'm not sure! Seems to get eaten pretty fast! Good luck. Let me know if you try it and how it keeps. hahaha. take the skin off. that makes me laugh. that’s the best part all deep fried and calorie-packed gondeoss. i tried to force the 2(and a half year old) to eat fish tacos(which yes i know sounds slightly wrong). I even put it in a muffin tray! no go. It's really good if you drizzle milk/dark chocolate over it. Yumm!